I have been waiting for some good January sales and Ellos did not disappoint. Some of the items I chose today have been on my wishing list for a while now, while I found some select new ones as well. 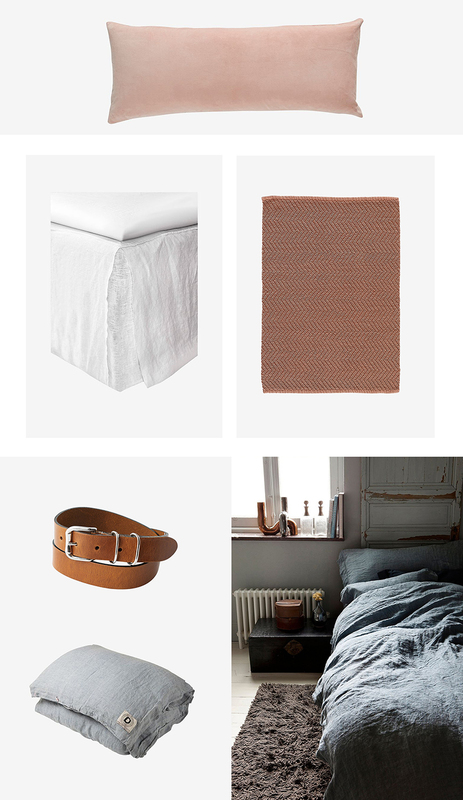 I will keep this brief with essentials for the bedroom today,since I’m almost finished painting and redoing my Oslo bedroom, these are some things that I think will create a great look for me as well. :: Big Velvet Pillow | This big pillow is perfect not just for the bedroom, but the living room as well. The Celina pillowcase is also part of the Conscious choice Ellos collection, and is now 30% off. :: Linen Bed Skirt | On the top of my list is a new bed skirt of my bed , they cover really nicely legs or a bed frame that does not look good, by design or age. The Himla Linen bed skirt is my favorite from any brand out there, and it is also now 30% off! :: Cozy rug | For the bedroom ( I need a rug for my feet when I wake up since the floor is cold) and the bathroom, the Tilde small rug from the Ellos home line is perfect and 30% off as well. The color is so me right now! :: Leather belt | You might be wondering about the belt, but I have been looking for sturdy but not too expensive leather belts so I can use them to bind magazines. This one from Esprit is perfect, it can be found here and it is also 30% off. :: Bed Linens | One thing I can never have enough of is bed linens ( and mugs). I have wanted a pair of Dirty Linen for a while now so when I stumbled along the Animeaux ones at Ellos at 30% off I knew I had to share! I am an NIB finalist!